For courses in Reading Methods (Supplementary) (Reading & Literacy) / Phonological Awareness and Phonics (Reading & Literacy). The ideal stage-specific companion to Words Their Way: Word Study for Phonics, Vocabulary, and Spelling Instruction. 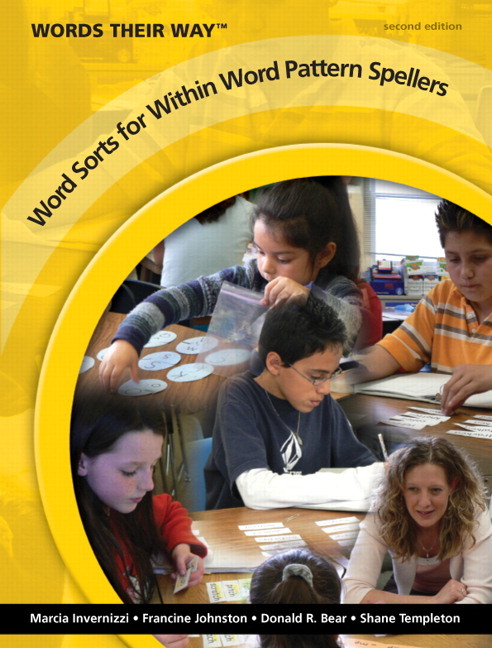 In keeping with the authors’ belief that the hands-on word sorting approach to word study is invaluable to teachers and students alike, this volume presents 59 prepared sorts covering the complete curriculum of word study for learners in the within word pattern stage of spelling development. 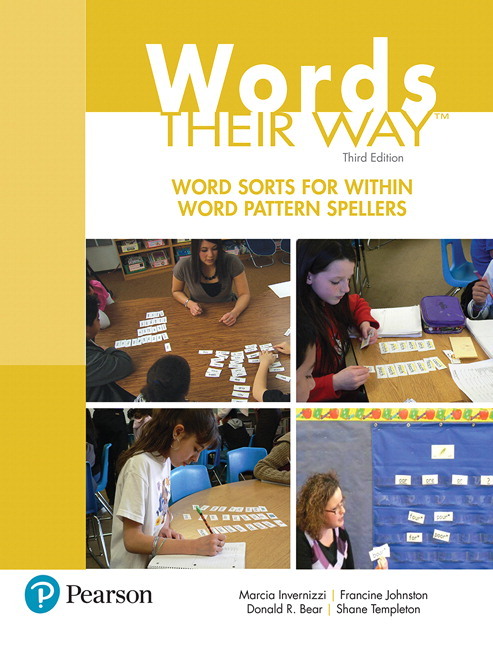 Complete with blackline masters, specific teacher directions, suggestions for follow-up activities, and spellchecks for ongoing assessment, the word sort lessons in this book help teachers to encourage students to think about words and reach conclusions about how the spelling system works. This third edition includes a number of new features to support effective teaching and learning, such as clearly stated generalizations for each lesson, suggestions on how to explore the meaning of words, and application activities that ask students to use the generalization to spell unfamiliar words and develop spelling and decoding strategies. Together, the Words Their Way core text and this supplement provide teachers with the knowledge and tools to meet the wide range of needs in today's classrooms. 59 prepared sorts cover the complete curriculum of word study for the Within Word pattern stage of spelling development. Literature Connections make links between features being studied and valuable children’s literature. Targeted Learners sections clarify which students will benefit most from the instruction. High Frequency Words receive special attention. Directions for how to introduce the sort as well as additional teaching tips in each lesson are included. NEW! Clearly stated generalizations for each lesson, along with suggestions on how to explore the meaning of words, and application activities to help students use the generalization to spell unfamiliar words and develop spelling and decoding strategies. NEW! Expanded step-by-step directions for each sort to encourage active thinking and open discussions with questions to guide reflection and generalizing. NEW! Clear guidelines for placing students in the lesson progression, along with suggestions for modifying the progression of sorts using a pacing chart. NEW! A goal setting form to help teachers more accurately monitor students’ progress throughout each unit. Clearly stated generalizations for each lesson, along with suggestions on how to explore the meaning of words, and application activities to help students use the generalization to spell unfamiliar words and develop spelling and decoding strategies. Expanded step-by-step directions for each sort to encourage active thinking and open discussions with questions to guide reflection and generalizing. Clear guidelines for placing students in the lesson progression, along with suggestions for modifying the progression of sorts using a pacing chart. A goal setting form to help teachers more accurately monitor students’ progress throughout each unit. Marcia Invernizzi is Henderson Professor of Reading Education in the Curry School of Education at the University of Virginia. She and her multilingual doctoral students enjoy exploring developmental universals in non-English orthographies. A former English and reading teacher, Marcia extends her experience working with children who experience difficulties learning to read and write in numerous intervention programs, such as Virginia’s Early Intervention Reading Initiative and Book Buddies. Francine Johnston is retired from the Department of Teacher Education at the University of North Carolina at Greensboro where she served as Director of Graduate Studies, Coordinator of the Reading Masters Program, and ran a clinic for struggling readers. Francine worked as a first grade teacher and reading specialist for 12 years before getting her doctorate at the University of Virginia where she first learned about a developmental approach to word study and worked with Dr. Marcia Invernizzi to develop word study materials and activities. She consults with school districts across the country and frequently serves as a professional development speaker. Francine is a co-author of many books, including Words Their Way: Word Study for Phonics, Vocabulary, and Spelling Instruction. Donald R. Bear is Professor Emeritus in Literacy and Director of Literacy Centers at Iowa State University and University the University of Nevada, Reno. A former elementary teacher, Donald currently researches literacy development with a special interest in students who speak different languages and he partners with schools and districts to think about how to assess and conduct literacy instruction. Shane Templeton is Foundation Professor Emeritus of Literacy Studies in the College of Education at the University of Nevada, Reno. A former classroom teacher at the primary and secondary levels, he has focused his research on the development of orthographic and vocabulary knowledge. He has written several books on the teaching and learning of reading and language arts and is a member of the Usage Panel of the American Heritage Dictionary. Marcia, Francine, Donald, and Shane are the core authors of the Word Their Way® series.